Squirmy the Worm learns that you have to be faithful when taking care of a plant. Children learn from the story of Daniel that when they are faithful in the little things, they will also be faithful in the bigger things. 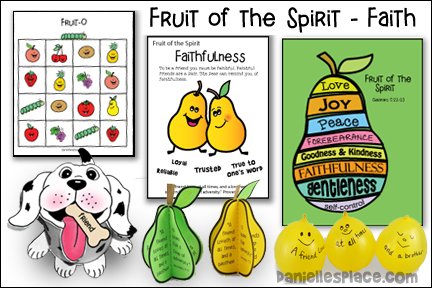 Children glue the Fruit of the Spirit puzzle pieces together to make a pair shape. This craft is available in both KJV using longsuffering, meekness and temperance, the NIV using forebearance. Patience is also included. 1. Before class print out the pear book patterns and make copies onto yellow paper. 2. In class have your children cut out the pear shapes. If you have younger children, cut them out before class. 3. 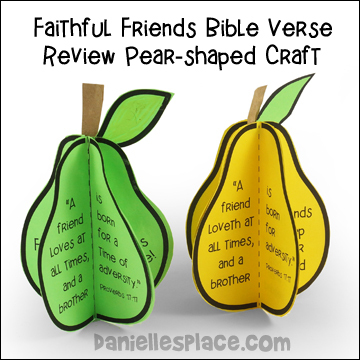 Have your children use a ruler and pen to trace over the fold lines on the pear shapes. This will make it easy for them to fold them in half. 4. Have your children fold them in half so that the printed part is on the inside, and then glue all the folded pieces back to back making a pile of folded pieces. Then glue the last folded piece to the back of the first piece to make the book circular. Dogs teach us faithfulness. We have to be faithful in feeding them everyday because they can't take care of themselves. 1. Write words on the bones which describe ways in which we can be faithful such as: pray, read the Bible, obey, don't lie, etc. Instruct your children that when they are faithful and do one of the things written on the bones, they can feed their faithful pup the bone. 2. 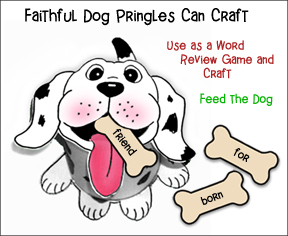 You can also use the dog as a Bible verse review game. 3. Print one word of the verse on each bone. 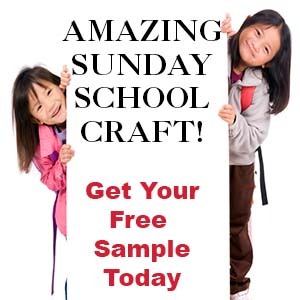 Instruct your children to try and find the first word of the verse. If they find the correct word, they can feed the dog. Keep playing until all the bones are gone. 2. Before class print out the questions pertaining the the Fruit of the Spirit lessons. Cut them apart, fold them up and put them in a lunch bag. 3. In class pass out out a Fruit-O card to each child. Tell your children that you will be asking them questions about the Fruits of the Spirit that they have studied so far. When they answer a question, they should put a marker on one of the fruits that match the answer. 4. Let your children take turns selecting pieces of paper from the paper bag. There is more than one of each fruit on the cards so they can pick which fruit they would like to mark. They can only mark one fruit for each question though and they may not move the marker once they have placed it. The child who gets four in a row first wins. You will need a large, solid-color rubber ball, large balloon, or beach ball, at least a foot wide, for this game. I bought a big ball at Wal-Mart for $3.00. (Beach balls would work better because they are easier to store when you are finished. 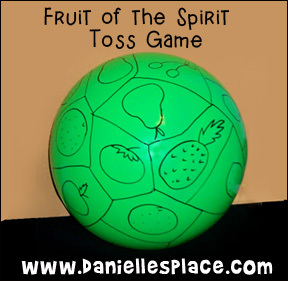 Draw pictures of the fruits studied so far in the lessons (apples, cherries, lemons, pineapples, tomatoes, oranges, and pears) on the ball with a permanent marker. Draw lines around the fruit pictures to enclose them in different shapes and connect them to the other fruit pictures. In class have your children stand in a circle. Start by rolling the ball to someone. When a child catches the ball tell him to look under his right thumb to see in which space his thumb is resting. He should then say what the fruit is and what fruit of the Spirit it represents. If you have older children you can just write the name of the fruit instead of drawing pictures. 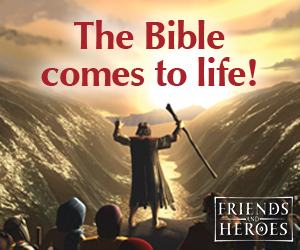 Or you can write Bible verse references to the Bible verses from this series of lessons and see if the children can remember the verses. You can also have the children throw the ball to each other, bounce the ball once on the floor before catching it, etc. You can also play like musical chairs and have the children pass the ball until the music stops. The child holding the ball should check where his thumb is setting and give the fruit of the Spirit represent by that fruit. In class have your children help you cut of the fruit into small chunks with plastic knives and place in a bowl. Add raisins, nuts, and miniature marshmallows to taste. Stir everything together with cool whip.